VMware End-User Computing Business Achieves Major Company Milestone. 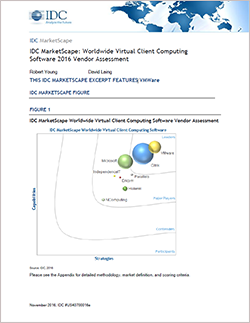 Technology analyst IDC recently published it’s report "IDC MarketScape: Worldwide Virtual Client Computing (VCC) Software 2016 Vendor Assessment” (doc #256606, November 2016), which ranks the VCC offering landscape. Find out which vendor came out on top. Download now to access your copy.